Passed peacefully surrounded by love on Tuesday August 21, 2018 at Wellington Terrace Long Term Care Home in Fergus. She was born in Kintore, Ontario, to Tena Holmes (d.1969) and Irwin "Pete" Robson (d. 1977). Predeceased by her brothers George (1942) and James (19‘67), husband George (1967) and son Robbie (1961). She will be deeply missed by her sons Peter and Doug and daughter Tina, grandchildren Lara (Tim), Robin, and Erin as well as by her nieces, nephew and extended family and friends. 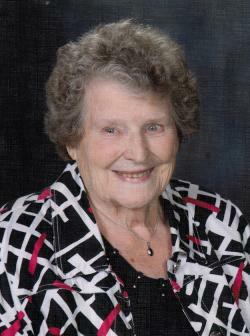 Muriel had a lifetime love of baseball starting with the Woodstock Shamrocks and Crushies, continuing with women’s softball leagues, and actively following her Blue Jays. Muriel retired from City of Guelph in 1990 and was active in the Guelph Industrial Softball league well into her 70’s, Guelph Calligraphy Guild, and Guelph Stamp Club, among others. She returned to her love of painting in her late 70’s, attending many classes at both Southampton Art School and the Evergreen Senior Centre. The family would like to extend their heartfelt gratitude to all the staff at Wellington Terrace Long Term Care where mom lived since May 2016 after suffering a stroke. Friends may call at the Gilchrist Chapel McIntyre & Wilkie Funeral Home, 1 Delhi Street, Guelph, on Sunday August 26th, from 2-4 p.m. Funeral Service will be held in the funeral home chapel Monday August 27th, at 11 a.m. Interment at Woodlawn Memorial Park following service. In lieu of flowers the family would be pleased if donations were made in Muriel’s memory to Wellington Terrace Long Term Care in Fergus, the Elora Swan Program (who placed swans in the Wellington Terrace pond for residents to enjoy), Bracelet of Hope, one of Muriel’s favourite charities, Trinity United Church Guelph, or a charity of your choice. We invite you to leave memories and donations online at www.gilchristchapel.com and they will be forwarded to the family.